Bucknell told me that one day he and Oswald went to a tavern near the base to drink a few beers. Two women approached them. Later that day Oswald told Bucknell the incident with the women reminded him of a experience he had had at Atsugi. Oswald had been alone in a bar when an attractive Japanese woman approached him, he told Bucknell. She asked him some questions about his work on the base. That work was, of course, with the supersecret U-2 program. Oswald,predictably, reported that conversation to his superior officer, who then arranged for a meeting on the base between Oswald and a man dressed in civilian clothes. Regarding Oswald’s tour of duty in Japan, Bucknell can only report what Oswald recounted to him. However, he was involved directly with Oswald in an intelligence effort when they both were at MACS-9. In1959 Oswald, Bucknell and others were ordered to report to the Criminal Investigation (CID) at the base. There a civilian began an effort aimed at recruiting those present for an intelligence operation against “Communists” in Cuba. Oswald was selected to make several additional trips to CID. Later he told Bucknell that the civilian who served as his contact or control at Atsugi had taken over the same job at Santa Ana. Still later, Oswald confided to Bucknell that he, Oswald was to be discharged from the Marine Corps very soon and that he would surface in the Soviet Union. Oswald told Bucknell that he was being sent there on assignment by American intelligence and that he would return to the United States in 1961 as a hero. 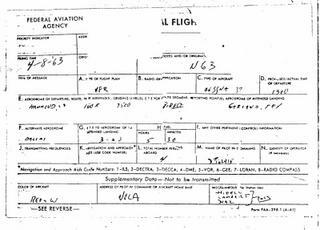 Here is a flight plan found by Jim Garrison during his investigation in New Orleans. Hidell was an alias of Oswald, Lambert allegedly an alias of Clay Shaw. WASHINGTON--The Justice Department dropped charges against a CIA operative indicted in 1973 for smuggling opium into the United States after the CIA argued that prosecuting the case posed a "national security" risk. A House subcommittee which investigated the incident concluded that by failing to prosecute this case the Justice Department "may have assisted in a cover-up of CIA participation in Southeast Asian drug traffic." In a supressed report, the House government and individual rights subcommittee recommended that an independent special prosecutor be appointed to investigate illegal activities of CIA personnel because of the Justice Department's "disturbing ineptitude and neglect" in this and other cases. The subcommittee report has not been made public because not enough members of the parent Government Oerations Comittee showed up to vote for it at the committee's final meeting of the year. However, a copy of the report was obtained by Scripps-Howard News Service. The smuggling case involved seven persons, six Americans and a Thai national who the CIA admitted was a "contract employee." The seven were indicted on Aug. 3, 1973, in Chicago on narcotics smuggling charges developed by the U.S. Customs Service, which intercepted a shipment of 25 kilos of raw opium from Thailand to Chicago. When prosecutors discovered that the Thai citizen was actually a CIA operative, they sought CIA assistance in pursuing their investigation, according to the subcommittee report. This became vital when the defendent promised he would testify that the CIA knew of his smuggling activities and approved them. After initially promising full cooperation, the CIA then balked, according to the subcommittee report, and refused to provide any of the documentation or rebuttal witnesses necessary to convict the CIA employee in the smuggling case. John K. Greaney, associate general counsel of the CIA, told the prosecutors that the necessary documents, if exposed would reveal sources and methods of on-going CIA operations in Southeast Asia, the report said. Greaney further refused to allow a federal judge to examine the documents to determine whether their exposure would jeopardize national security, the subcommittee found. The U.S. Attorney in Chicago then appealed to the Justice Department to intervene with the CIA. On April 15, 1974, Henry Petersen, then assistant attorney general in charge of the criminal division, and other Justice officials met with Greaney, who reiterated his claim of "national security" and asked that the case against the CIA employee be dropped. Petersen testified that he ordered subordinates to look into the matter. Two weeks later, William e. Ryan, the narcotics section chief in the criminal division, signed dismissal papers dropping charges against the CIA operative. "Neither Ryan nor Petersen asked to see the documents in order to judge whether they were relevant or too sensitive", said the subcommittee report. "They simply accepted the CIA's assertion." "The behavior of CIA officials in this case indicates that they still believe that the agency and its employees are above the criminal law and that CIA personnel may be set above the law by the mere invocation of 'national security'," the report concluded. On March 28, 1976, the Dallas *Morning News* ran an unusual story when four Dallas deputy constables decided to come forward to relate something that had been bothering them for a very long time. Shortly after the assassination the four had examined a box of handwritten notes and assorted other papers in the Dallas County Courthouse, a number of which apparently linked Oswald and Ruby. Deputy Billy Preston, Constable Robie Love, and deputy constables Mike Callahan and Ben Cash all recalled that this box had come from the apartment of a Dallas woman (77). Preston said, "She was really scared because she had all that stuff. She wanted me to pick it up for her. And I just wished I had made some more copies now." The men couldn't for the life of them remember the name of the woman, except Preston thought her first name was Mary. He recalled that the papers were apparently written by Lee Harvey Oswald. Ben Cash disagreed, recalling that the woman had a live-in "Latin American" boyfriend, and Cash thought the papers had been his. He told reporter Earl Golz that ". . . he mentioned Ruby and he mentioned Oswald in the writings. He didn't mention the third party but he kept referring to a third party. And the third party would have to be him." According to Preston and Love, the box was turned over to Dallas DA Henry Wade in late 1963 or early 1964; Wade told the Morning News that he had no recollection of such a box of papers (78). The deputies tried to recall some of the box's contents. They named newspaper clippings from Mexico; a photocopy of a *Daily Worker* presscard issued to Jack Ruby; a motel receipt from early November 1963 withboth Ruby and Oswald's name on it, as well as references to phone callsmade to Mexico City; papers mapping out a landing strip in Mexico; references to meetings with some kind of "agents" in McAllen and Laredo, Texas (near the Mexico border); a church brochure with handwritten notations concerning a trip to Cuba; and a handwritten note detailing a plan to assassinate President Kennedy during the dedication of a lake or dam in Wisconsin. No one has seen hide nor hair of this mysterious box full of papers since the deputies transferred custody of it. 77. Dallas *Morning News,* March 28, 1976; Marrs, *Crossfire,* 410-1. Notice that Dallas District Attorney Henry Wade denied all knowledge of the matter-which is not what he later told the Enquirer. Mr. Billy J. Preston, Executive Deputy, Precinct 1, Dallas County, Dallas Dallas, Texas, advised that he is an executive deputy in Precinct 1 under ROBIE LOVE, Constable, Dallas County, Dallas, Texas, and he obtained thirty-three documents, including one 2- by4-inch spiral-bound notebook from Mrs. MARY SIMS, who resides at 4311 Cole, Apartment E, telephone LA 1-4764. He stated Mrs. SIMS is employed as a clerical secretary for the Stanley Warner Management Corporation, Dallas, Texas, telephone number RI 8-0781, Extension 28. He said that Mrs. SIMS told him these documents were obtained by her from one BILLY LEE JONES, also known as H.L. JONES, who claimed to be a great-great, grandson of WILLIAM H. (BILLY THE KID) BONNEY. He said that Mrs. SIMS told him that JONES, a transient, stays at the City Mission on South Ervay in Dallas and allegedly resides at an unknown address in San Antonio, Texas. She told him that she wanted to check up on this man inasmuch as he claimed to be formerly connected with the office of Naval Intelligence and she recalled typing a report for him concerning JACK RUBY's going to Cuba. Mr. PRESTON advised that the documents had been turned over by him to the District Attorney of Dallas County and believed that Assistant District Attorney FRANK WATTS had examined them and made photostats of them for any interest they might have in the trial of JACK RUBY in Dallas County for the murder of LEE HARVEY OSWALD. He also advised that this subject called Mrs. SIMS twice on the night of January 27, 1964, advising her that he was in Myrtle, Mississippi, at Camp Zion. He said Mrs. SIMS told him that the subject told her something abouth the Marine Corps—Love Field, and mentioned Serial No. 634168. He said that Mrs. SIMS resides with a girl whose nickname is “PUTSY”. He was unable to supply additional information concerning her roommate except her roommate was employed by the V.A., Dallas, Texas. He advised that JONES had advised SIMS that he was in the Carlson Raiders of the U.S. Marine Corps Intelligence and called her sometime before the 23rd and claimed that he was with DAVE SCARBORO, an attorney from Abilene, Texas, and advised SIMS that he and SCARBORO were in an automobile accident and were hospitalized in a hospital at Fort Worth, Texas. So, were Oswald and Ruby Castro agents? Not likely, in my opinion, but someone went to a lot of trouble to make it appear that that was the case. The box of documents unquestionably existed and just as unquestionably disappeared while in government custody. Documentary evidence that Jack Ruby conspired with Lee Harvey Oswald and a third man to murder John F. Kennedy was found two months after the assassination, say four Dallas police officers who saw the material. The documents clearly stated that Cuban dictator Fidel Castro ordered Kennedy killed—and that the three “did it for Castro, the officers declare. Dallas District Attorney Henry Wade confirms he personally received the evidence from the officers at his home on Jan. 23, 1964. Wade, in turn, handed the documents over to the FBI. But an ENQUIRER probe of the Warren Commission’s archives shows that the documents are inexplicably missing. “The papers Preston picked up contained a receipt for a motel room outside New Orleans in two names—Lee Harvey Oswald and Jack Ruby! "This receipt was dated two months before the assassination occurred. "There was a document among the papers detailing how the assassination was accomplished. I have no doubt the writer of that document was the third man involved in the killing. "It revealed the whole conspiracy and I believe the writer intended it to protect his own life—he could warn others who knew that if anything happened to him, the document would be released. * The document Cash mentioned, laboriously handwritten in part-English, part-Spanish, giving accurate details of the assassination. It also recounted an earlier plan to assassinate Kennedy in Wisconsin in September 1963—which was abandoned because security around the President was too tight. * Newspaper clippings identifying the author of the document—the third member of the assassination team—as a Texas-born gunman who had hired out repeatedly as a professional killer in Mexico. “There were notes stating clearly that Fidel Castro had Kennedy assassination, tht the killers were doing it for Castro,” Preston stated. “The notes also spoke about Ruby and Oswald meeting in New Orleans, about trips to Mexico City, and about visiting the Cuban and Mexican embassies. Preston said the documents included a membership card, No. 52, in the “Fair Play for Cuba Committee,” issued to Jack Ruby. 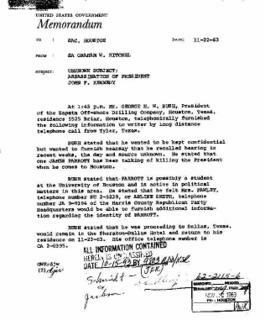 The committee was a pro-Castro group, and Oswald is known to have passed out leaflets for it in New Orleans. The papers also included a press card issued to Ruby at a Chicago address by the Daily Worker, a communist newspaper. The box containing the documents was given to Preston after he got a call from a girl he knew, who was rooming with another girl named Mary. She said Mary had something Preston should see. Preston went there and Mary told him her boyfriend had left her with a file of papers. “Mary was an employee of Paramount Pictures, and some of the notes made by her boyfriend were on the stationery of the company,” Preston said. “I remember one thing very well: that girl was scared! Dallas Deputy Constable Michael Callahan stated that he too had seen the contents of the box when Preston brought it back to the constable’s office. “I saw a message in it about going to Cuba,” he said. Cash said the documents were turned over to District Attorney Wade that same night, and he saw them handed over by Preston. Wade confirmed it. A search of the Archive yielded the report itself—but no documents. The report, bearing Bureau File Number 105-82555, states definitely that the FBI received the documents on Jan. 28, 1964, but they are not with the report, nor is there any reference in the report to enclosures or attachments. Nevertheless, The ENQUIRER, with Johnson, made a thorough search of the Archives. The missing documents were not found. When The ENQUIRER went back to FBI spokesman Hayes to report that the documents were not in the Archives as stated, he refused to discuss the matter—leaving side open the question of what happened to this startling evidence after the FBI received it. Cash added: “We knew they were important. I believe that if they had been released then, we would have had World War 3. And Preston noted: “I was surprised when none of us who saw the documents were ever questioned or called before the Warren Commission. But after 12 years of silence, the deputy constables said, they decided to reveal the evidence because Congressional probes hinting at a cover-up had encouraged them to speak out. Tomorrow: Could it be true? Speculation.-Patrolman J. D. Tippit, Bernard Weissman, and Jack Ruby met by prearrangement on November 14, 1963 at the Carousel Club. Commission Finding.-Investigation has revealed no evidence to support the allegation. Nor is there any evidence that any of the men knew each other. Excerpts from an FBI document from the National Archives (#180-10020-10469), dated March 28, 1967. 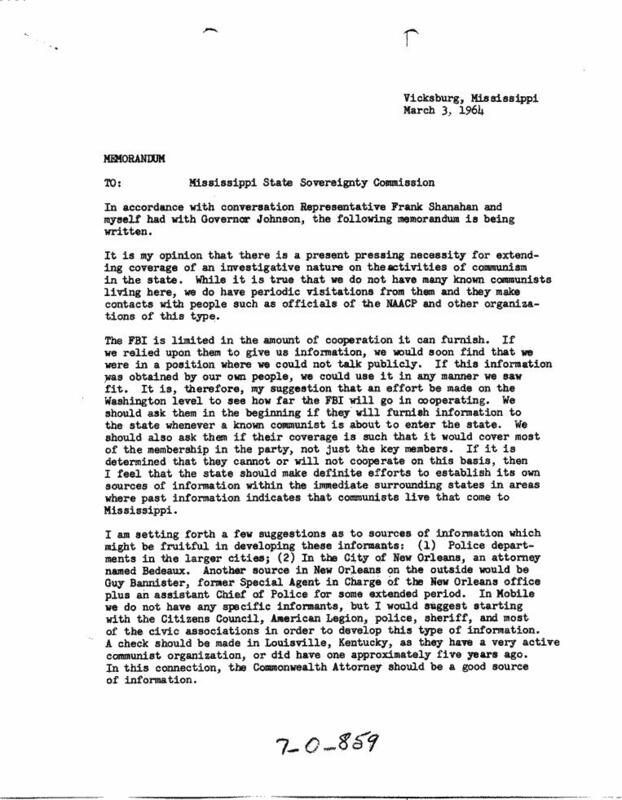 The original document is a teletype and is in all caps. Waldo indicateds that on or about Dec. Seven, Sixtythree, he met Sutton at the Dallas Press Club and was introduced to Phil Burns, White male, age late thirties, five feet eight, one forty five lbs., chestnut hair, wore glasses and employed by some advertising firm on account of one of Sutton's sponsors. After many assurances that identity would be protected, Burns related that he was acquainted with Ruby [about one line redacted] also that he knew officer Tippit since he had seen him in uniform at the club which apparently was on his beat. Burns indicated he passed a table and Ruby greeted him saying, "You know J.D. here", and Ruby then introduced the other individual as Bernard Weissman from the East. Burns described Weissman as white male, thirtyfive years, black hair, over six feet tall. Burns allegedly returned to his table and Ruby sent him a complimentary drink. I do not know at this point if the FBI located Paul Bridewell. I believe that Bridewell may have been using an alias because he was in the Carousel Club with a woman who was not his wife. This is the first time I have posted on anything that happened in this century but last night I was watching Fox and they had G. Gordon Liddy talking about Valerie Plame. Liddy, of course, rightly did time in a federal prison, and hopefully Karl Rove will also. Liddy was saying that Plame was not a CIA operative and it was all no big deal and just politics. The CIA apparently disagrees according to this story from 2003 from the Detroit Free Press. It's just a 12-letter name -- Valerie Plame -- but the leak by Bush administration officials of that CIA officer's identity may have damaged U.S. national security to a much greater extent than generally realized, current and former agency officials are saying. Plame, the wife of former ambassador and Bush critic Joseph Wilson, was a member of a small elite-within-an-elite, a CIA employee operating under nonofficial cover, in her case as an energy analyst, with little or no protection from the U.S. government if she got caught. Training agents such as Plame, 40, costs millions of dollars and requires the time-consuming establishment of elaborate fictions, called legends, including in this case the creation of a CIA front company that helped lend plausibility to her trips overseas. Now, Plame's career as a covert operations officer in the CIA's Directorate of Operations is over. Those she dealt with -- whether on business or not -- may be in danger. The CIA is conducting an extensive damage assessment. And Plame's exposure may make it harder for U.S. spies to convince foreigners to share secrets, U.S. intelligence officials said. Bush partisans tend to downplay the leak's damage, saying Plame's true job was widely known in Washington, even if it wasn't spoken of. And, they say, she had moved from the directorate, the CIA's covert arm, to an analysis job. But intelligence professionals, infuriated over the breach and what they see as the Bush administration's misuse of intelligence on Iraq, vehemently disagree. Larry Johnson -- a former CIA and State Department official who was a 1985 classmate of Plame's in the CIA's case officer-training program at Camp Peary, Va. -- predicted that when the CIA's internal damage assessment is finished, the harm "will be huge, and some people potentially may have lost their lives." "This is not just another leak. This is an unprecedented exposing of an agent's identity," said former CIA officer Jim Marcinkowski, now assistant city attorney in Royal Oak. He trained with Plame. "We only used first names," he said of his CIA training. "But the bonds you make are similar to that in the military." The leak of Plame's identity to columnist Robert Novak and other journalists is the subject of a Justice Department investigation that has rattled President George W. Bush's White House. Knowingly revealing the identity of a covert agent is a crime. Critics say the leak was meant to intimidate critics such as Wilson, a former ambassador who traveled to Niger to investigate claims that Iraq was seeking uranium ore for nuclear weapons. Wilson found no basis for the claims and later publicly criticized Bush's description of Iraq's nuclear weapons program. One mystery is how one or more officials at the White House knew of Plame's work, since the CIA and other intelligence agencies guard the identities of their covert officers, often even from their political superiors. Much about Plame's career remains a mystery, and probably will stay that way. The CIA refuses to acknowledge her employment or anything else associated with the case. Born in 1963, she graduated from Pennsylvania State University and was quickly recruited by the CIA, attending training classes in 1985. In 1990 and 1991, Plame was attached to a U.S. embassy in Europe. In April 1999, Plame, using her married name of Valerie E. Wilson, donated $1,000 to then-Vice President Al Gore's 2000 presidential campaign. She listed her employer as Brewster-Jennings & Associates. A June 2000 listing in Dun & Bradstreet for a Boston-based Brewster Jennings & Associates names the company's chief executive officer and only employee as Victor Brewster, and says it had annual sales of $60,000. While that might seem like flimsy cover, former intelligence officials say that meticulous steps are taken to create a lifelike legend to support and protect CIA officers operating under nonofficial cover. The corps of officers using nonofficial cover is small, said former CIA analyst Melvin Goodman, a critic of Bush's handling of intelligence. The program was the subject of an internal battle, he said, opposed by traditionalists, who favored the orthodox method of having spies pose as U.S. diplomats or military officers. On a personal level, if Plame's covert career wasn't over already, it is now. "My wife's career will certainly change as a consequence of this, but my wife is a star in her business," Wilson said Oct. 5 on NBC. He added: "I have every expectation that her culture will embrace her and that she will continue to be a productive national security officer. But clearly her responsibilities will have to change as a consequence of this." Wilson has said his family is taking unspecified security precautions. His wife won't talk to reporters. "The bottom line is: She's lost her career," said former classmate Marcinkowski. As a CIA officer operating overseas, "there's only one entity in the world that can identify you: that's the U.S. government. When the U.S. government does it, that's it," he said. Marcinkowski, 48, of Oxford said his relationship with Plame has spurred a flurry of media appearances, including a segment on CNN, a Time magazine interview and an appearance on ABC's "Nightline." Marcinkowski left the CIA in 1989 after four years with the agency. The allegation that Oswald was a suspect at the time of the Walker assassination attempt in April of 1963--and that he was either arrested and let go or that his arrest was prevented--have been around for a long time but only recently have I seen any evidence at all to support it. The following is from notes found in the collection of researcher Irvin Heineman. The notes are apparently from conversations Irv had with Sue Fitch concerning her interview of witness Juanita Buchanan, wife of Larry Buchanan, the owner of a "dive bar." She knew Jack Ruby and he gave her a job as a cocktail waitress at the Sovereign Club in 1959/1960. She said that Ruby was epileptic and she saw him have seizures . . . She and Buchanan bought a place on Haskell Avenue, the Eldorado Bar . . . Bill Duff, whom she calls Scotty, came in in the place with Jerry Dickinson, her husband's boss at Jamison Films. Duff said that he was the son of the Duke of Argyle and was married to General Walker's niece from California. He said that he was General Walker's house guest but he expressed hatred for General Walker. Duff came in the place twice with Oswald. He introduced him as Lee (last name not remembered--he never called him Oswald.) She is positive that it was Oswald. Oswald did night have much to say. The night of the Walker shooting, they were in the place on Haskell together and left about 8:00 p.m. Duff came back about 11:30 p.m. and she had heard on the radio about the shooting at Walker's house. She asked Duff, "Why did you try to shoot General Walker? He is a pretty good old boy." Duff turned white as a sheet, left, and never came back. Duff was also in the place with a man named Andre who had a thick accent. (The first time she told Mrs. Fitch it was Danish and later said Dutch.) [Later the notes indicate that Andre's real name was Don Moon and he was from Texas.] Duff had a Scotch accent which he lost from time to time. The night of theWalker shooting the police arrived about 30 minutes after Duff left, looking for Duff. He was arrested. Oswald was also arrested. The car was traced to Duff. The boy in the back of Walker's house got the license number of Duff's rented car, a foreign make. Duff moved into the Hidden Hills with Chuck Holloway. He had two rifles and a couple of pistols. Two men moved into Hidden Hills and asked Duff to help them kill Walker; offered him $25,000 and gave him $5,000. Duff got suspicious and went to the FBI (to see Hosty). Duff left town and went to Oklahoma where he said he was going to join the army. The FBI had lost track of Duff and had called her within the last week or 10 days to ask if she had heard anything about him. . . . The Eldorado bar was the regular meeting place of Ruby, Oswald, Duff and Tippit. . . .
Ruby came to her place three days before the assassination, trying to buy the place. She has had several telephone calls saying "If you know what's good for you you will keep your damn mouth shut." Speculation.--The Dallas police suspected Oswald and Ruby of being involved in an attack on General Walker and planned to arrest the two when the FBI intervened, at the request of Attorney General Robert F. Kennedy, and asked the police not to do so for reasons of state. Commission Finding.--This allegation appeared in the November 29, 1963 issue (actually printed on November 25 or 26) of a German weekly newspaper, Deutsche Zeitung und Soldaten Zeitung, published in Munich. The allegation later appeared in the National Enquirer of May 17, 1964. The Commission has been reliably informed that the statement was fabricated by an editor of the newspaper. No evidence in support of this statement has ever been advanced or uncovered. In their investigation of the attack on General Walker, the Dallas police uncovered no suspects and planned no arrests. The FBI had no knowledge that Oswald was responsible for the attack until Marina Oswald revealed the information on December 3, 1963. It might be pointed out that neither did the FBI (or the Warren Commission) exhibit any curiosity as to how an obscure German newspaper knew about Oswald's alleged involvement in the Walker assassination attempt before they did. The murderer of Kennedy made an attempt on U.S. General Walker's life early in the summer when General Walker was sitting in his study. The bullet missed Walker's head only by inches. Oswald was seized, but following investigation--as it was reported to us--was stopped by U.S. Attorney General, Robert Kennedy. In the case that Oswald would have been imprisoned for many years and so he would not have been able to commit the murder of John F. Kennedy, the brother of Robert Kennedy. Washington--The hottest story making the rounds here is that the U.S. Justice Department prevented the arrest of Lee Harvey Oswald and Jack Ruby BEFORE the assassination of President John F. Kennedy. 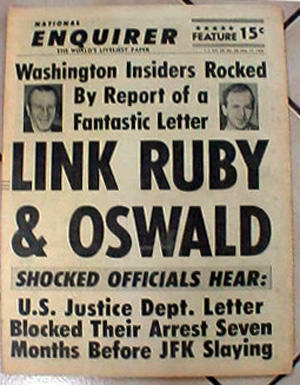 Oswald and the man who killed him, Ruby, were suspect of being partners in crime seven months before the President's death. 1. That the Justice Department deliberately kept Oswald and Ruby out of jail before the assassination. 2. That Dallas cops suspected Oswald of being the gunman and Ruby the paymaster in a plot to murder former Major General A. Walker--seven months before the President was assassinated. 3. That the U.S. Central Intelligence Agency was using Ruby to recruit commandos for raids against Castro's Cuba. To prevent this explosive information from being disclosed, the CIA asked the Justice Dept. to step in and stop the Dallas police from arresting Jack Ruby, as well as Oswald. A top-secret document--a letter signed by a high official of the Justice Dept.--was sent in April 1963 from the Justice Dept. to Dallas Chief of Police Jesse E. Curry requesting the Dallas police NOT to arrest Oswald and Ruby in connection with the attempted slaying of General Walker. After a sniper shot at, but missed, General Walker in Dallas, April 10, 1963, Dallas police suspected that Oswald was the sniper and Ruby the payoff man. The cops were set to arrest the pair. But they never got the chance because of the heavy pressure brought to bear by the Justice Dept. And so Oswald and Ruby were allowed to remain free. An seven months later, on last November 22 in Dallas, Oswald was able to kill the President of the United States. The top-secret document--a copy of it is reportedly in the hands of the Presidential commission investigating the assassination--bares a web of intrigue that involves the Federal Bureau of Investigation, along with the Justice Dept. and the Central Intelligence Agency. It is so politically explosive that the Presidential commission, headed by Supreme Court Chief Justice Earl Warrent, has even withheld it from one of its own members, Senator Richard Russell (D., Ga.). It is feared that Senator Russell, who leads the South in the fight against the civil rights bill, might use the document against the Justice Dept. and its chief, Attorney General Robert F. Kennedy, a leader in the fight for civil rights. The document--requesting the cops not to arrest Ruby and Oswald--contradicts the FBI report on the assassination and the subsequent murder of Oswald. A high FBI was asked by a top official in the Justice Dept., after it was notified by the CIA of the potentially volatile situation in Dallas, to request Dallas police not to arrest Oswald or Ruby. The FBI official refused to do so, saying it would be obstructing justice and therefore would be a crime. The FBI man said he would make the request only if he were officially directed to do so in a communication signed by the official. 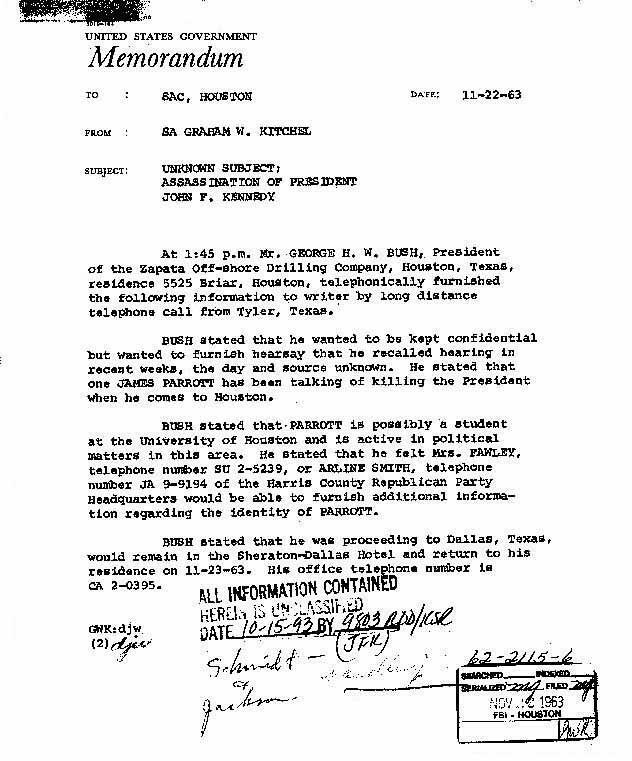 The FBI official then recieved a signed directive. He contacted Dallas police and urged them not to arrest Oswald and Ruby. But the Dallas police also wanted an official signed communication. Thereupon the Justice Dept. sent the communication to Dallas Police Chief Curry asking that Oswald and Ruby be left strictly alone. The department explainted it didn't want Oswald and Ruby arrrested because of "reasons of state." The President went to Dallas knowing and protecting his November assassin Lee H. Oswald from prosecution for his April Crime "Attempted Assassination of the former General working at his desk in his Dallas home, 9:00 p.m. April 10. The Kennedy protection included an early-morning secret release of the prime suspect Lee H. Oswald, from Dallas Police Custody on Kennedy orders, April 11. The President did not live to know that he knew his assassin but everyone else lived to know that he did and that his assassin could not be prosecuted for the November Crime of his Kennedy protection from prosecution for his April Crime. Now over forty years later no documentation on these alleged events or the alleged Justice Department communication has been found. Neither do our sources seem very credible--an American supermarket tabloid and a German neo-Nazi publication. Tomorrow: could it be true? New evidence. With no emotion in his voice, but with his hand trembling, Angleton replied: "Fundamentally, the founding fathers of the U.S. intelligence were liars. The better you lied and the more you betrayed, the more likely you would be promoted. These people attracted each other. Outside of their duplicity, the only thing they had in common was a desire for absolute power. I did things that, in looking on my life, I regret. But I was part of it and loved being in it. Allen Dulles, Richard Helms, Carmel Offie, and Frank Wisner were the grand masters. If you were in a room with them you were in a room full of people that you had to believe would deservedly end up in hell." Angleton slowly sipped his tea and then said, "I guess I will see them there soon." One of the Directors of Friends of Albert Schweitzer College, incorporated in the State of New York in 1953 was Percival F. Brundage. According to Armstrong the earliest known list of students was from the 1957-58 year, consisting of 30 students, none from Switzerland. "In 1973, Mr. Brundage and another former Government official were said by sources in the charter airline industry to have acted for the Central Intelligence Agency in the 1960 purchase by the C.I.A. of Southern Air Transport of Miami. The agency apparently used the airline in paramilitary missions in the Congo, the Caribbean and Indochina." According to Armstrong a May 19, 1975 Newsweek article linked Brundage to Southern Air Transport, Double-Chek Corporation, the Robert R. Mullen Company, and Zenith Technical Enterprises. All of these are CIA fronts or CIA-affiliated companies. The Robert R. Mullen Company provided cover for CIA operatives under Project QKENCHANT while Howard Hunt was working there, after he retired from the Agency. "Percival Brundage's links the these and other organizations raised the distinct possibility that Albert Schweitzer College was either a creation, of or received funding from, the CIA." Perhaps, although more likely the latter I would think as a web-search reveals a number of references to to Albert Schweitzer College as a small but legitimate liberal college with strong Unitarian links. And if Brundage was linked to the CIA (although he was primarily an accountant not a spy) he was also a long-time, and surely sincere, Unitarian. 1. J. Monroe Sullivan's San Francisco Trade Mart is not the same institution as Clay Shaw's New Orleans Trade Mart. 2. I think the Benjamin Sonnenberg Jr mentioned by Mark Lane is the son of the Sonnenberg cleared for QKENCHANT. Ben Jr. is a friend of Alexander Cockburn and has claimed he worked for the CIA in Europe. 3. After 10 years, the CIA responded to my appeal of the withholding of information about Guy Banister by sending me some documents which had been released 6 years earlier under the JFK Act. One, a 26 August 1960 memo from John G. Southard, Chief, CCD/NC to Chief OS/SSD/I&S, says that "[s]ubject organization ['Guy W. Banister Associates, Inc.'] is of interest to CCD/NC for QKENCHANT purposes. However, before clearance action is initiated on the company principals, CCD/NC wishes to determine whether their business volume and the appearance and location of their office lend themselves to the type of cover operation we propose. Therefore, it is requested that a special inquiry be conducted on this organization [by Sept 12]." There are two versions of a 13 September 1960 field report on Banister. One 13 pages; the other a 3 page summary which indicates it was prepared by the Los Angeles Field Office. My copy of the summary report is illegible. The report noted that Banister was let go by the New Orleans Police Department after a 1957 bar incident, that Banister Associates passed NSF checks, that the Louisiana Employment Security Division had a tax lien against Banister Associates and that Banister associated with right-wingers like Kent Courtney. A 21 September 1960 memo for "SSD File" by E.E. Kuhnke, Jr., indicates that some version of the 9/13 report was "brought to the attention of Mr. Ned White, CCG/NC". After White discussed the report with "Jack Southard", it was decided not to use Banister Associates. Jim O'Connell [an Office of Security employee involved at this time with Robert Maheu and the CIA/Mafia plot against Castro] "furnished CCG with an alternative private detective company." The documents I've seen don't explain the nature of the cover operation considered or how Banister was selected as a potential member of the QKENCHANT club. On March 4, 1959, 5 days prior to be being promoted to Private 1st Class for the second time, Lee Harvey Oswald completed an application to attend the Albert Schweitzer College in Switzerland. The application was lodged on 19 of March, with a $25.00 registration fee being made on June 19. August 17 found him applying for a dependency discharge from the Marines which was duly granted on the 28th of that month. Exactly one week later, Lee applied for a passport, listing his occupation as "shipping export agent", and the purpose of his travel as attendance at the Albert Schweitzer College, Churwalden, Switzerland, and at the University of Turku in Finland. He also stated his intention to visit Cuba, the Dominican Republic, England, France, Germany and Russia as a tourist. His application to the college gave the names of two fellow Marines as people who could provide references; James Botelho and Robert Calore. Neither were called to give testimony before the Warren Commission, though Botelho did provide an affidavit on June 3, 1964. Unfortunately, this statement provided no information concerning any discussions Oswald may have had with him on this matter, nor any indication that he was contacted by the college. Such was not the case however, in the affidavit supplied by Dennis Call who had been stationed at Santa Ana with Oswald. Call related in his statement how, "On one occasion, Oswald remarked to me that he had been awarded a scholarship to Albert Schweitzer University and that he planned to attend, remarking that they taught English [Call likely meant 'German'] at Schweitzer." Was this perhaps, Lee's way of saying he had assistance of a type which couldn't be openly stated? Another of his Santa Ana Marine acquaintances, Henry Rousell Jr, recalled that prior to studying Russian, Oswald had studied German. Although Germany was on his itinerary, the main language of Switzerland is also German. Proof Rousell's memory was accurate is found among Oswald's notes which show a clear, though perhaps rudimentary, effort to teach himself this language. All of this suggests that Oswald did, at least initially, believe he would be attending the college. A further entry, "[illegible] F.R.G. Tempelhofer Damm." suggests a possible rendezvous point in West Berlin was also on his original itinerary. As history indicates, Oswald did not attend the Albert Schweitzer College, but instead, made his way to the Soviet Uniona where he was to stay for about two and half years. What then, was the purpose of this college application? At his own request, Oswald was transferred from active duty to the Marine Corps Reserve under honorable conditions in September of 1959, 3 months prior to his regularly scheduled separation date, ostensibly to care for his mother who had been injured in an accident at her work. As an inactive Reservist, Oswald could be called up in a mobilisation any time during the balance of his enlistment (3 months) and therefore could not leave US shores without a legitimate reason. One reason recognized as legitimate by the authorities was "education". How Oswald found out about this obscure little college has long been regarded as something of a mystery. Not even the Swiss authorities could locate it easily in 1960 after being contacted by the FBI. This contact was the result of Marguerite, Lee's pertinacious mother, contacting the State Department, concerned when mail for Lee had been returned undelivered. The answer to the mystery may well be found in his relationship with Kerry Thornley. Thornley - a noted right-winger - was, at the time he and Oswald served together, attending the very left-wing church of Unitarian led by Stephen Frichman (1). The Albert Schweitzer College was owned and operated by the International Association for Religious Freedom (IARF). According to its website, The IARF began in 1900 as the International Council of Unitarian and Other Liberal Religious Thinkers and Workers on May 25th in Boston with the stated aim of "opening communication with those in all lands who are striving to unite Pure Religion and Perfect Liberty, and to increase fellowship and cooperation among them." Religions within the association include Unitarian-Universalists, Buddhists, Humanists, Muslims, Shintoists, Sikhs, Quakers, Greek Orthodox, and Old Romans. It is the oldest interfaith organization in the world, and has attained NGO status with the UN. According to Richard Boeke of the IARF, the college had between 25 and 30 students at the time he visited in 1964. He also relates how US students brought in marijuana, and that "the college was in a bit of trouble with the Swiss." Two or three years later, he continues, the college was moved to a location near Geneva and a director was imported "who liked to live well". On a second visit, Boeke found no students there whatsoever. Information about the college therefore, could have come through Thornley via Frichman's church. But there was also a significant US government connection to the college. Brundage was a Unitarian, and from 1953 to 1958, he was president of the US fund-raising body for the college, which was known as Friends of Albert Schweitzer College. Moreover, between 1952 and 1955, he was president of the IARF. In 1956, Brundage was made Director of the Bureau of the Budget. He retired in 1958, but continued with the Bureau in an "advisory" position for a further two years. As Budget Director, he was involved in Project Vanguard (2) which was the result of NSC 5520 and "was intended to establish 'Freedom of Space'--the right to overfly foreign territory for future intelligence satellites. The initial estimate of its cost was $15-20 million, but by mid-1956 the program was already over budget and estimates of its total costs continued to grow. "$2.5 million of the budget for this project came from the CIA (3). The "coincidence" of Brundage holding the purse strings for a program dealing with the hot issue of overflights and being heavily involved with the Albert Schweitzer College should be way too big for any reasonable person to swallow. Brundage's real character, publicly so virtuous, was summed up by reporter, Eileen Shanahan in a 1992 oral history interview for the Washington Press Club Foundation:"But I remember running into some real bigoted people with a background in business. I remember in particular Eisenhower's last budget director, a guy named Percival Brundage, who was an accountant. And I had a lot of sources in what was then the Bureau of the Budget. And I got stories they wished I hadn't gotten. And I found out from one of my sources, that Brundage had actually-this was plainly illegal-a Secret Service man investigating me to see who I was sleeping with to get my stories." The IARF was was not the only religious organization springing from the US to have set up a college in Switzerland in 1955. The other one was called L'Abri. Unlike the Albert Schweitzer College, L'Abri seems to have grown, and now has colleges across Europe, Asia and the US. The founder of this "fellowship" was Dr Francis Schaeffer. Schaeffer's history is most revealing. Prior to starting his Swiss college, he had been very closely associated with the virulent anti-Communist, anti-Semitic Carl McIntire and his American Council of Christian Churches (ACCC). McIntire had studied at Princeton under J. Gresham Machen, in whose conservatism and orthodoxy, McIntire found much that he admired. An article by Linda Minor provides another possible point of interest: according to the article, Schaeffer had been sent to Europe during WWII by the Presbyterian Church Foreign Missions Group,"mostly to different cantons in Switzerland--at the same time Allan Dulles was there." Switzerland had been awash with intrigue during both WWII and the Cold War. As pointed out by researcher, Herbert Blenner, suspected Soviet spy, Noel Field, a former State Dept employee and friend of Alger Hiss, was also in Switzerland during this time period, doing relief work with refugees on behalf of the Unitarian Church. Over time, Schaeffer through his book, A Christian Manifesto, has become the Poster Boy of the Christian Right. To him, the notion of separation of Church and State was preposterous; to him, and to those who have followed, there can be no separation of powers, because such separation only aids the enemy... and the enemy... is liberalism. "At the level of morality, right and wrong is a matter of individual conscience. One must, however, move beyond this to the level of social ethics, for duty, according to Hegel, is not essentially the product of individual judgment. Individuals are complete only in the midst of social relationships; thus, the only context in which duty can truly exist is a social one. Hegel considered membership in the state one of the individual's highest duties. Ideally, the state is the manifestation of the general will, which is the highest expression of the ethical spirit. Obedience to this general will is the act of a free and rational individual. Hegel emerges as a conservative, but he should not be interpreted as sanctioning totalitarianism, for he also argued that the abridgment of freedom by any actual state is morally unacceptable." In the section headed, Active Part Taken in Organizations, Oswald wrote: "Student body movement in school for controll (sic) of Juvenile Delinquency.Member Y.M.C.A. and A.Y.A. associations." The truth is though, that Oswald himself had been classified as a juvenile delinquent while living in New York City during 1953/54, resulting in his being sent to Youth House for psychiatric assessment. On April 27, 1953, the Senate Subcommittee on Juvenile Delinquency was established. Hearings were held by the subcommittee in NYC on April 21, 22, and on June 4, 1954. These hearing centered on the impact of comic book violence on youth. Prior to the hearings, evidence was gathered from numerous sources such as courts, youth workers, police, social workers, and probation officers, as well as from the comic book industry itself (4). This is part of the familiar pattern of coincidences which surrounded the life of Lee Harvey Oswald, because the reason for Lee's NYC problems was his truancy. As noted by John Carro, his Probation Officer, Lee advised him "...that he generally gets up at 9 A.M. and watches TV and reads magazines until 3-4 P.M., in the afternoon." The magazines of course, were actually comic books, and the subcommittee would soon be looking into the effects of TV violence in the same manner. As there is no evidence whatsoever, to suggest Lee was ever involved in any such "student body movement", could this instead, be a veiled reference to some involvement with, or approach made by, the subcommittee? It has to be said that if either of the senate subcommittees mentioned in this article, had been handed Lee's file from the court or Youth House, it would have been noted he was intelligent, socially isolated, able to keep secrets, and in need of "direction"--In short, it would have been easily discerned he may be useful for some purpose at some time. One of the subcommittee members was James Eastland. Eastland became chairman of the more infamous Senate Internal Security Subcommittee in 1955, and held that position until 1977. Throughout his work on these committees, he maintained close ties with like-minded individuals such as Mr HUAC himself, Joe McCarthy, and with Robert Morris, who had been heavily involved in the SISS and HUAC hearings. Prior to this work, Morris was on a New York State Assembly committee investigating schools and colleges for Communist activities, and some of those investigations carried over to his Federal subcommittee work. The possible significance of this is that Lee was reported to Carro by PS 44 for refusal "...to salute the flag during early morning exercises." Yet despite the Communist hysteria which surely pervaded the school system because of these various committees, the many reports made on Lee during this period show nothing to indicate he was ever questioned about his loyalty, or possible Communist sympathies. Talk about red flags being raised! A few years later Oswald was interviewed by Aline Mosby in Russia. He related to her how his interest in Marxism dated back to when he was living in New York. The catalyst, he told the unimpressed reporter, had been when an old lady handed him a pamphlet about the Rosenbergs, though he also confessed he did not know why he remembered the incident. John Carro contacted Lee's school on November 19 and was advised that Lee's behavior had improved dramatically, that he was now saluting the flag, and that he no longer presented as a problem. Within two months, he was back in the city of his birth. If his conversion to Marxism did happen in NYC, then it had to have been within the last couple of months before leaving, and there would also likely be some noticeable marker for it. There is none. His aforementioned sudden improvement in behavior followed a court ordered contact with the Protestant Big Brothers and other religion-based community services. Members of the SISS tended to be of the Christian Right. Robert Morris for example, was closely aligned with Fred Schwartz's Protestant dominated group, Christian Anti-Communism Crusade. It has to be borne in mind that these NY contacts with religious groups may have been the start of a pattern which saw Lee go on to join the CAP where he met with David Ferrie -- who had failed hopes of priesthood--but who would eventually take the title anyway, after having his nomination withdrawn by Bishop George A. Hyde of the Old Catholic Church--a church closely associated with those favoured by certain White Russians under whose influence Lee and Marina would one day fall. It was also associated by virtue of common roots and IARF membership with the Quakers and the Unitarians. Hyde, as some will no doubt recognize, was Quaker Ruth Paine's maiden name. The League for Industrial Democracy (LID) was founded in 1905 by, among others, Socialists Jack London and Upton Sinclair, and the Unitarian Minister of the Community Church of New York, John Haynes Holmes. It's stated aim was to educate Americans about the need to extend democracy to every aspect of society. In 1922, Norman Thomas, the perennial presidential candidate from the Socialist Party, joined Harry Laidler as co-executive director of the LID. Mr Jenner: Would you describe what you understand the cooperative movement is? Mrs Paine: I think consumers cooperative is somewhat different. I am not certain what [a] farmers cooperative is. I know that [my parents] were interested in and voted for Norman Thomas when they were in New York. At the height of Cold War tensions during the 1950's, the LID took on an anti-Communist stance, and as with so many other organizations of the era, garnered some close ties to the CIA. London's books today, just as much as when first published, are considered works of inspiration by the Unitarian-Universalist Church. Though it may come as a surprise to some, Darwin was of the Unitarian faith. His book, Origin of Species, led his cousin, Francis Galton to study heredity. From these studies, Galton coined the term "eugenics" for his emerging theories that selective breeding would improve the human race. Eugenics would eventually be incorporated into Nazi philosophy, lending a "scientific" credence for the Holocaust. Despite this background, eugenics continues to this day in the guise of "population control" and genetic research. It is the one area in which liberals, conservatives and libertarians seem to have found some common ground. For an example of the madness generated by eugenics adherents, look no further than the March 3, 1967 issue of the Washington Post. Page A6 carried one story on the declining birth rate, while another bemoaned the cutbacks in what it termed "antipoverty" funding for family planning services. "Antipoverty", of course, in relation to family planning, is a euphemism for "encouraging" the poor to stop breeding. Norman Vincent Peale, a Minister of the Dutch Reform Church in New York, wrote The Power of Positive Thinking. Although he claimed to be non-political, behind the scenes, Peale was politically conservative and vehemently opposed to liberals such as Kennedy. In fact, he was at the very forefront of opposition to Kennedy during the 1960 election based on the Catholic factor, leading a group calling itself the National Conference of Citizens for Religious Freedom (a name suspiciously similar to the International Association for Religious Freedom), and standing side by side with the Protestants and Other Americans United for Separation of Church and State. On September 7, 1960, on behalf of these groups, Peale declared that a Roman Catholic President would be under "extreme pressure from the hierarchy of the church" to align the foreign policy of the United States with that of the Vatican.By September 19, however, there had been a huge backlash, and the New York Times reported on that date that Peale was trying to distance himself from these anti-Catholic groups. It also published the text of a statement Peale had made through a syndicated column in defense of his actions. It started: "Because my participation in the recent Washington meeting of Citizens for Religious Freedom has resulted in the group being called 'the Peale group', I feel it necessary to clarify my own participation in their Washington meeting of Sept 7, 1960. I did attend the study conference as it was called, as one of 150 clergymen and laymen and was asked to preside at one session. I believe that it is perfectly appropriate for a group of Protestants or any group to meet to discuss and consider the possible impact of the election of a Catholic President upon religious liberties in the United States. However, I did not call this meeting and had nothing to do with setting it up..."
"...While in Europe I received an invitation to attend a Study Conference on Religion and Freedom scheduled for Washington on sept 7. Beyond the names of a few people who were to be present, I had no information on the meeting itself, but I had respect for those whose names were given to me. I arrived in New York from Europe on the afternoon of Sept 6, and therefore had no opportunity to secure further information on the meeting..."
These were mostly outrageous lies. In fact, about the only truth was that he had been in Europe--specifically, Montreaux in Switzerland. There, on August 18, he headed a group of 25, possibly including Billy Graham, in a secret meeting to discuss how they could derail Kennedy's election bid (this places Peale in Switzerland at the same time Oswald would have been there had he followed through with what appears were his original plans). The result, of course, of this secret meeting, was the formation of the Washington group and the alliance with Protestants and Other Americans United for Separation of Church and State. So who were some of his cohorts in these groups? There was William C. Jones, a board member of The Billy Graham Foundation; Gen. William Kelly Harrison Jr (ret); OK Armstrong, ultra-conservative Republican of Missouri; Unitarian Minister and anti-Catholic polemicist, Paul Blanshard; evangelist, Dr Harold Ockenga and; Dr L. Neslon Bell, father-in-law of Billy Graham. Two other members, Robert Grant and Donald Ellis, had murky histories of involvement in the KKK. But 1960 was not the first time Peale had shown his real colours. In May 1952, he joined a seemingly disparate group of conservatives including Fulton Lewis Jr, Roscoe Pound, Clarence Manion, and Felix Morley, to endorse a ten-page pamphlet entitled Senator McCarthy and published by Freedom Clubs, Inc. The pamphlet conceded that McCarthy's earlier attacks on the State Department had been "rude and crude." It rationalized this crudeness as the natural reaction to the "pugnacious refusal of the Truman Administration to assist Congressional investigations of the loyalty of Federal employees. "The recent investigations conducted by the Internal Security Subcommittee of the Senate Judiciary Committee, the pamphlet concluded, had "already substantiated a large part of the charges of Senator McCarthy, and well may lead to proof of all of these charges." The possible significance of this cannot be ignored: Peale, named against all odds by Oswald as one of his favourite authors (given Lee was by then, a self-styled Marxist), not only was in Switzerland at the time Oswald was to be there, he had an interest in, and (as will become obvious) connections to, the very subcommittees which probably were privy to Oswald's Youth House files! Peale's associations behind his facade of "positivism" which kept him at the top of the best-seller lists, is damning, but the desire to maintain a broad appeal to middle America necessitated such a facade. Fulton Lewis Jr was a Bircher who openly endorsed lynchings. High on his list of "lynchees" was Earl Warren.There was Roscoe Pound, Dean of Law at Harvard, and a mainstay of the Protestant Establishment. Clarence Manion was Dean of Law at Notre Dame. He was also a Bircher, and was on the JBS organised, Committee Against Summit Entanglements which conducted nationwide protests against the '59 Eissenhower-Krushchev Summit. Gen. Albert C. Wedemeyer was also a member of this committee. Wedemeyer had been Chief of Staff to Generalissimo Chiang Kai-Shek during WWII. Felix Morley - yet another Bircher. All of those Bircher associations make a connection to another Bircher - the aforementioned senate subcommittee investigator - Robert Morris - exponentially likely. Moreover, Peale also had possible channels to the committees through Nixon, and Hoover with whom he shared Masonic membership. Hoover gave lectures at the Grand Lodge of New York where Peale was Grand Chaplain. The name Robert Morris is a very familiar one among the assassination research community. He was a friend and supporter of Gen. Edwin Walker, was on the board of Young Americans for Freedom (YAF), and gave encouragement and assistance to Larrie Schmidt and Bernard Weissman of Conservatism USA (CUSA)--the two main principals behind the infamous black border ad published in the Dallas Morning News on the day of the assassination. Schmidt arrived in Dallas from West Germany shortly after Oswald arrived in Fort Worth from Russia. "Traditional denominations sent in their lists of churches as requested with particulars. However, as I moved down the line I began to discover odd things -- that many listed churches actually had the phone numbers of local bars; others were rather weird organizations with mysterious identities that, I discovered, were using their directory listing as a credential. And as I became more familiar with this operation, some of the Council staff confided to me that I was really working for a scam outfit that raised money exclusively to support its leadership's salaries, that its right wing businessmen (fundamentalist) trustees did not even reside in NYC, that its executive head was a slum landlord in Albany, that several of the major Protestant organizations (Episcopalians and Presbyterians and its Brooklyn branch) were fully aware of these anomalies and had quietly disassociated themselves from this $1,000,000 a year operation which was foisting itself on the public as the Protestant 'voice' of NYC. As fronts, it had enlisted 5 popular Protestant clergy -- Adam Clayton Powell, Jr. and Norman Vincent Peale among others -- whose names were prominently displayed in its promotions..."
In a shorter article on the same subject, Kent indicates that as far as he knew, neither Powell nor Peale made money from the scam--and indeed, he seems prepared to give them both the benefit of the doubt as far as even being knowingly involved goes. However, since Peale associated with, and had the same moral instincts as, the types of right-wing businessmen Kent says were behind the directory, such benefit was very likely misplaced. And these are the same religion-based charities to which Oswald had been referred to by the NYC court system! The question to be explored is whether Robert was related by blood to Dr Hjalmar Schacht. Hjalmar was considered a financial genius, and is largely credited with financing Hitler's rearmament in preparation for war. His parents, who had lived in the US were great supporters of New York Tribune editor and social reformer, Horace Greeley. Greeley, as it turns out, was a member of the Universalist Church which was closely aligned to the Unitarians long before they joined to become one church. If Greeley was a member of this church, it seems logical that Hjalmar's family were also members. Hjalmar's full name was Hjalmar Horace Greeley Schacht, with the "Horace Greeley" part given him to honor his father's hero. Unfortunately, Hjalmar did no honor to that name. Prior to Hitler's rise, he had cozied up to the Socialists, and it was not until after he secured the deals with US and British bankers which would result in Hitler's ability to wage sustained war with the Allied Forces that he turned his total allegiance publicly to the Nazi regime. To put that another way, he was still publicly aligning himself with the Socialists even after the Fascists took the election. In a report on one fund-raising trip to the US, the NYT of October 3, 1930 quoted him as saying, "You seem to take Hitler seriously. Why should not the German's do so? I myself do not take him too seriously..."
(1) Frichman's name was found in the note book of Richard Case Nagell. (2) Also involved in Project Vanguard was the civilian Director of Army Research and Development, Richard Stetson Morse. Morse had previously been the president of the National Research Corporation (NRC) - a company he himself had founded. The NRC was involved in researching WMD for government agencies. John C Jackson, who worked for the NRC, lived with Jack Ruby in the 1950's. 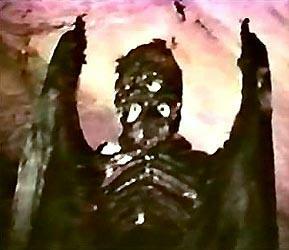 He told the FBI Ruby helped him find finance for his experiments. This fits with the NRC's use of venture capital as a means of adding another layer of plausible deniability for those on whose behalf the work was being done. (3) The CIA also entered into the Brundage story later during Operation Mongoose. It was Brundage who set up all the proprieties for JMWAVE. William Davy, in Let Justice Be Done, has argued that this memo shows that Clay Shaw was "an active covert operative." Others, including an alleged ex-CIA employee posting on the internet, have maintained that QKNCHANT involved only routine debriefing of people in the trade industry, and that Clay Shaw's involvement, if any, was unwitting. What was Project QKENCHANT? In an attempt to shed some light on this question I will examine several CIA documents. 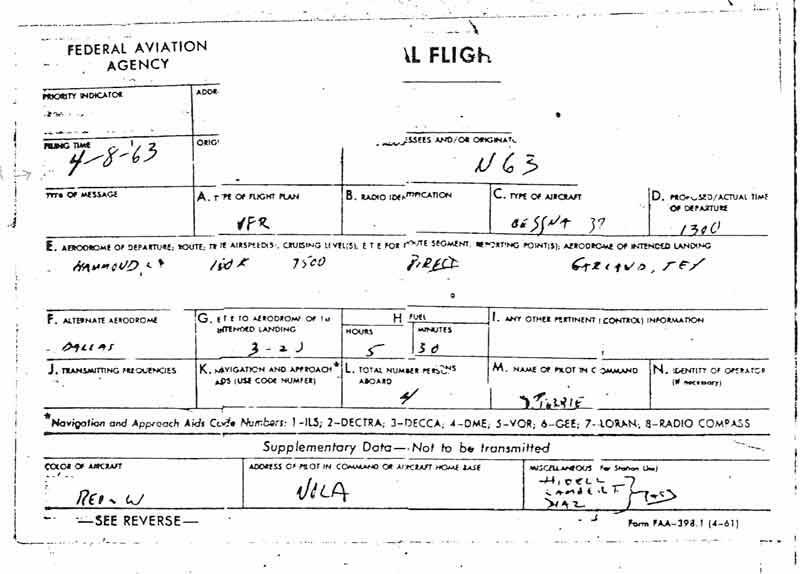 According to a CIA document (RIF #104-10418-1042) one Guy D. Johnson "was granted a covert security clearance on 12 January 1954 to permit his use in the U.S., for cover purposes in connection with project QKENCHANT." This was not the Guy Johnson who was an acquaintance of Jim Garrison and at one time a lawyer of Clay Shaw, but a businessman involved in the exporting of printing equipment. According to his obituary in the New York Times, posted by Jerry Shinley on May 26, 1999, "Mr. Johnson had traveled extensively in Latin America, selling printing equipment ..." There are two points in this memo worth noting. First, the reference to Johnson being used for "cover purposes." Secondly the memo states: "His security file does not reflect whether he was actually used." Obviously even CIA analysts have only limited knowledge of CIA activities. 1. ... "E. Howard Hunt, who retired from CIA effective 30 April 1970 is now an employee of the Robert M. Mullen Company in Washington D.C., and it will be necessary to make him witting on our relationship with the company." 2. This will verify the conversation between Messrs. Mahoney and Luskokie on 28 May 1970 in which a CSA under project QKENCHANT was requested concerning Mr. Hunt Robert D. Gahagen Chief Central Cover Staff Corporate Cover Branch"
According to The Nelson Rockefeller Report to The President by the Commission on CIA Activities (Manor Books, 1975), p. 175: "After Hunt came to work for Mullen he was told, with CIA's consent of the existing cover arrangements so that he could deal with administrative matters when necessary during Mullen's frequent absences from Washington." Also according to the Rockefeller report, "Robert Mullen had, however, for many years cooperated with the CIA by making some of his overseas offices available at different times as a cover for Agency employees abroad." CIA document #104-10124-10103 refers to a request for a QKENCHANT clearance for Hugh Chisholm McDonald, the author of the book Appointment in Dallas. The memo is dated 8/3/76, after that book came out. This memo states: "Office of Security records do not support Mr. McDonald's claims to Agency employment or involvement in clandestine operations. From 1955 to circa 1061 Mr. McDonald, as an independent contractor, assisted Technical Service Division/Authentication Division/DDP in the development of the Identikit.."
In May 1969 McDonald formed World Associates, Inc. The memo states: "In June 1969 Central Cover Staff evidenced interest in Mr. McDonald under Project QKENCHANT. Commencing in January 1970 Mr. McDonald initiated meetings with the Domestic Contact Service suggesting that his firm, World Associates, Inc., soon to be involved internationally in bank security, could be used for intelligence procurement. The Office of Security files do not reflect the outcome of the Domestic Contact Service and the Central Cover Staff interests." "a. Mark LANE said on the acknowledgment page of Rush To Judgement: ‘I am deeply indebted to Benjamin SONNENBERG, Jr. whose numerous and invaluable suggests have found their way into this volume. b. Benjamin SONNENBERG was granted a CSA on 29 June 1959 for use under Project QKENCHANT. The CSA was revalidated for continued use on 26 July 1965." Mr. Sonnenberg is described as a director of the publishing firm of Henry Holt & Co, the publisher of Lane's book. "Traces on Subject have been run in RID/Main Index, the index of Security and the Central Cover Staff. The first showed only a 1951 FBI interview with SHAW about a former employee of the New Orleans Trade Mart. The second showed that 00/Contacts Division had requested a name trace about 1949 and that the check of FBI records then conducted was negative. Central Cover Staff has no record." Clearly the Central Cover Staff should have had a record if Shaw had been cleared for QKENCHANT. 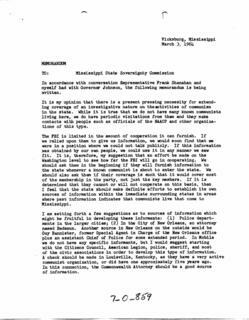 As Jerry Shinley posted on 26 April 2000 at alt.assassination.jfk, "this clearly shows that the CIA did not possess the information to run a thorough security check on Shaw and that the only Office of Security record on Shaw was the 1949 name check. If Shaw had been approved for QKENCHANT, that should have come up during the Office of Security check." Given that the CIA was apparently using the International Trade Mart under QKENCHANT for cover purposes, it is a bit surprising that Shaw may not have had a CSA under Project QKENCHANT. Further research is clearly called for. 1. As you requested on 16 January, the History Staff has now surveyed CIA's records from the House Select Committee on Assassinations (HSCA) investigation into the assassination of President John F. Kennedy. As promised in my 30 January interim report, I can now give you a full account of our findings, and of my recommendation for transferring this HSCA collection at its existing classification to the National Archives through CIA's Historical Review Program. 7. CIA Complicity? Our survey found nothing in these records that indicates any CIA role in the Kennedy assassination or assassination conspiracy (if there was one), or any CIA involvement with Oswald. These records do reveal, however, that Clay Shaw was a highly paid CIA contract source until 1956.